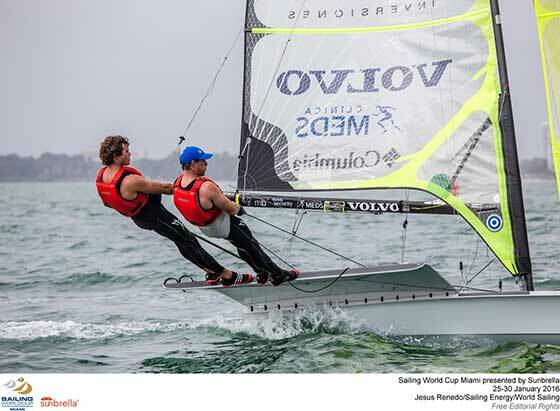 Sailing World Cup Miami presented by Sunbrella acts as the Olympic continental qualification regatta for sailors from North and South America. Qualify here, you'll be representing your country on the grandest of stages, miss out, it's the end of the road. Torrential rainfall and a chill in the air, Miami isn't usually like this, but competition for World Cup honours and Rio 2016 Olympic spots are keeping the temperatures on Biscayne Bay hot. Competitiveness from the front to the back of each fleet has been evident and every sailor has something to fight for. Whether it's the coveted Rio spot, a Sailing World Cup honour, internal qualification for Rio 2016 or even striving to perfect their game, it's all on in Miami. 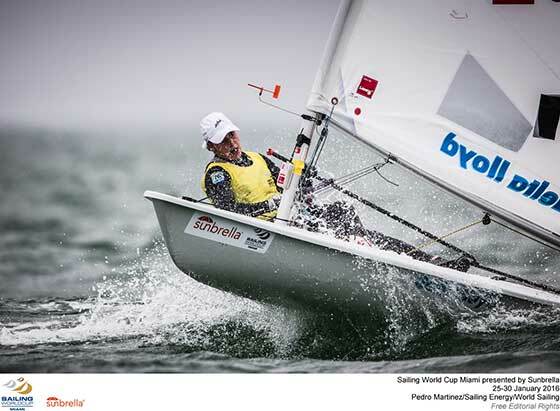 Jason Waterhouse and Lisa Darmanin (AUS) regained the Nacra 17 lead after they finished ahead of overnight leaders Mandy Mulder and Coen de Koning (NED) in both of the day's races. Guatemala's Jason Hess and Irene Abascal were in the driving seat for the Olympic spot but two poor results enabled Uruguay's Pablo Defazio Abella and Mariana Foglia to hit them on the counter attack. Canada's Luke Ramsay and Nikola Girke have a strong advantage in the North American qualification duel. They are more than 60 points clear of the only other hopeful, Puerto Rico's Enrique Figueroa and Franchesca Valdes. Ramsay and Girke will want to stay out of trouble on Friday to book their nation another Rio 2016 place. Billy Besson and Marie Riou (FRA) were Thursday's Nacra 17 stars after double bullets. They are fourth overall. Diego Botin and Iago Lopez (ESP) and New Zealand's Alex Maloney and Molly Meech held on to top spot in the 49er and 49erFX respectively. Race wins went the way of John Pink and Stu Bithell (GBR) in 49er Gold, Ryan Seaton and Matthew McGovern (IRL) in 49er Silver and Ida Marie Nielsen and Marie Olsen (DEN) in the 49erFX. Chilean brothers Benjamin and Cristóbal Grez Ahrens haven't made things easy on themselves in their battle against Uruguay's Santiago Silveira and Philipp Umpierre for the South American 49er Rio spot. A disastrous start and up and down results gave the Uruguayans the advantage after two days. The Uruguayans were positioned to make the gold fleet with the Chileans back in silver ahead of Wednesday's so they had it all to do. Match racing was the name of the game and the Chileans forced the Uruguayans hand with an OCS and BFD to squeeze them back into silver fleet. American sailors Paris Henken and Helena Scutt as well as Emily Dellenbaugh and Elizabeth Barry have put their nation in a strong position to qualify in the 49erFX. Henken and Scutt are 18th on 142 points and their compatriots, 21st on 161. Their nearest rivals are U.S. Virgin Islanders Mayumi Roller and Agustina Barbuto who trail on 181 in 23rd. Aruba's Odile and Philipine Van Aanholt hold 226 points in 32nd. Chile's Arantza Gumucio and Begoña Gumucio are the only South American entrants who have not yet qualified for Rio 2016 so will qualify this week. Bouwmeester, who won the silver medal at the 2012 Olympics and the 2015 Laser Radial World Championships, is probably being modest. But her day did have one significant, and totally unexpected, hurdle that she handled with a veteran's poise. Van Acker is the defending Olympic bronze medalist, but there's a lot of Laser Radial talent in Belgium and she won't know until late spring whether she'll return to the Olympics. North American sailors from the Cayman Islands, Cuba, St. Lucia and Trinidad and Tobago missed out on the gold fleet as Bermuda's Cecillia Wollman and Mexico's Natalia Montemayor advanced. Nine points separated them before Thursday's racing but they ended up even on 95 points apiece after the single race. Wollman finished 39th and Montemayor, 40th. Results would lead to suggest some strong tactics coming in to play with three races on Friday to determine who will go to Rio de Janeiro this August. After sailing a nearly flawless qualifying series, Rutger van Schaardenburg (NED) had his first significant bobble of the regatta when he was caught over the line before the gun and didn't return to start correctly, recording a 50-point OCS. As he's able to discard that score, he retains the overall lead, but the margin has narrowed. Jean-Baptiste Bernaz (FRA) is currently second overall after getting a fourth today. Bernaz has been on a tear of late, with top-five finishes in his four of his last five major regattas. The lone blip, a 54th at the 2015 Laser World Championships, has knocked his world ranking down to 22nd, but he's sailing like a medal contender at this event. "The first few races I had bad starts and it was difficult conditions, it was shifty and light, and I just made bad decisions at the beginning of the race,” he said. "I knew I had the speed to do better and the ability to do better. 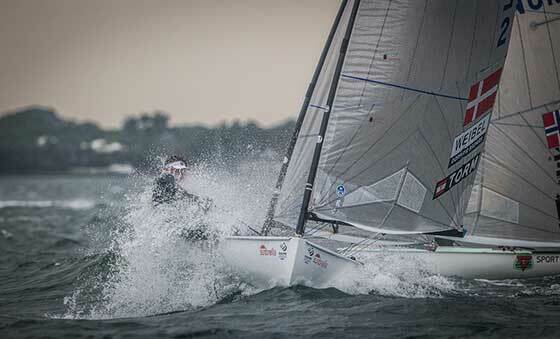 From the third day I started to sail more with the fleet, more consistent, better starts. He hasn't been as dominant as he was at his peak, when he won eight world championships, but Scheidt is a serious medal threat, and anyone who thinks the pressure of competing in his home country will compromise his performance should check Scheidt's track record. Among other accomplishments, his final Laser world championship was won on Brazilian waters. He knows what to expect, and how to handle it. Mexico's Yanic Gentry made the gold fleet in the cut and with none of his rivals from Bermuda, Cayman Islands, Dominican Republic and Puerto Rico making it, he has qualified his nation in the Laser. 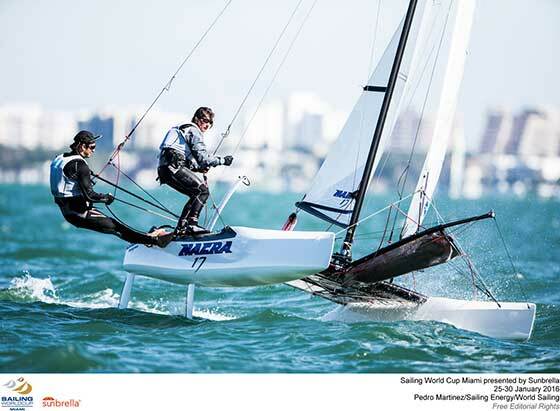 All of the South American sailors aiming for Rio 2016 are in the silver fleet and no racing was possible on Thursday. As it stands, Venezuela's Jose Gutierrez is 65th on 139 points, Uruguay's Federico Yandian 66th on 140, Ecuador's Matias Dyck on 145 and Colombia's Andrey Quintero 84th on 180. With a win in today's lone race, Lara Vadlau and Jolanta Ogar (AUT) moved into a tie for first place with the Brazilian team of Fernanda Oliveira and Ana Luiza Barbachan. Those two teams are starting to stretch away from the rest of the fleet. As this fleet is one of the smallest in the regatta, it will be hard, but not impossible, for anyone else to claw back into contention for the win. The other teams in the top five are Shasha Chen and Haiyan Gao (CHN), Marina Gallego and Fatima Reyes (ESP) and Sydney Bolger and Carly Shevitz (USA). Onan Barreiros and Juan Curbelo Cabrera (ESP) were the only team in the top six of the Men's 470 fleet to record a top-five finish today. As a result the Spanish duo pushed their lead over Stu McNay and David Hughes (USA) out to five points. Panaglotis Mantis and Pavlos Kangialis (GRE) are third, nine points further back. A point behind third is Matthias Schmid and Florian Reichstäder (AUT). While there are three races scheduled for tomorrow, it's hard to imagine anyone outside that top four making a serious challenge for the lead. It's one on one in both North and South America for Rio 2016 Olympic qualification. Canada's Jacob Chaplin-Saunders and Graeme Chaplin-Saunders, on 53 points, have a good advantage over Mexico's Jeronimo Cervantes Belausteguigoitia and Ander Belausteguigoitia, on 90 points, in the North. Canada's Allison Surrette and Alexandra Ten Hove are uncontested for the North American spot so will seal that place this week. Chile's Nadja Horwitz and Sofia Middleton are poised to take the South American spot, holding a 36 point advantage over Argentina's Mercedes Travascio and Delfinia Bellagio. It was the grey beards who dominated today's lone race in oldest of the Olympic classes. Olympic silver medalists Jonas Hoegh-Christensen (DEN) and Zach Railey (USA) went 1-2 in the race and now hold those same positions in the overall standings. But in reality, the top six, who are separated by just three points, are standing on a level playing field with three races scheduled for tomorrow and then the double-points medal race on Saturday. The other sailors in that top group are Jorge Zarif (BRA), Jake Lilley (AUS), Lei Gong (CHN) and yesterday's leader Caleb Paine (USA). Colin Harrison, Jonathan Harris and Russell Boaden (AUS) are third overall heading into Friday's final Paralympic races. The Race Committee had to manually input the results from the RS:X race course into the results system after racing. Results will be available in due course.